Done with winter and ready to get out and about again, now that the days are getting longer? 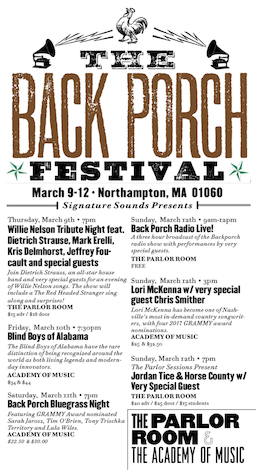 The 3rd annual Back Porch Festival offers an All-American lineup of artists at the Academy of Music and The Parlor Room, right here in downtown Northampton. The Festival takes its name from the Sunday morning radio program on the local station, 93.9 The River, and includes many of the artists which are typically featured on the show. As the snow melts outside your doorstep, get out and enjoy your community! It can lift your spirits and break any isolation that winter may have fostered. Often times we use our monthly herbal remedy column to highlight something seasonal or related to that month, however this month I decided on maca root simply because of how amazing it is! 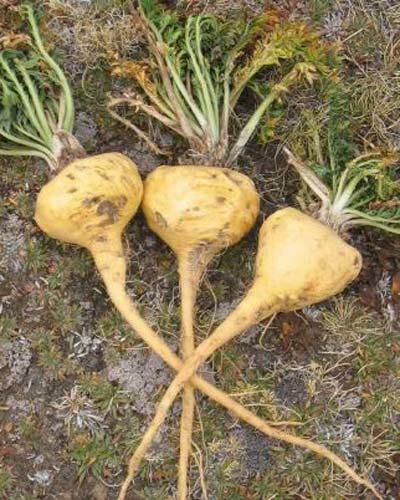 Maca has been cultivated and grown in the Andes Mountains for thousands of years. It is considered a relative of the radish and has a beautiful light brown color. 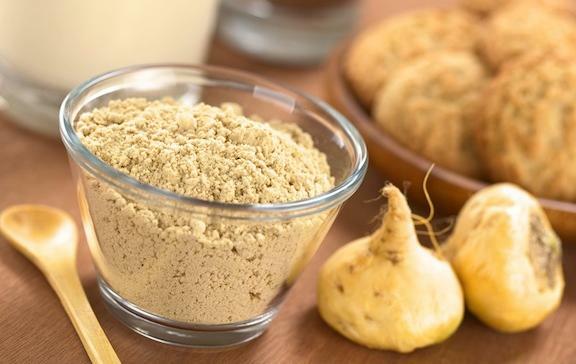 Considered a 'Superfood', maca is often used for chronic adrenal fatigue, regulating hormones, fertility, libido, immunity, circulation and stamina. I love how beautiful and rich it looks and tastes and love to add it to food because it is food! It has such a rich, nutty and intense flavor. Try adding maca root powder to smoothies, oatmeal, baked goods, soups, dips and pancake mix. The flavor is quite intense, so a little goes a long way; you can experiment with it. You may find it being used more and more as an ingredient in products at your local health food store. A personal favorite of mine is chocolate-infused maca! If you would like some formal instruction on how to use it, we are including maca root powder in this month's recipe--see below. For therapeutic purposes, it would be most useful to take in capsule or liquid (tincture) form and to follow the instructions on the package label. 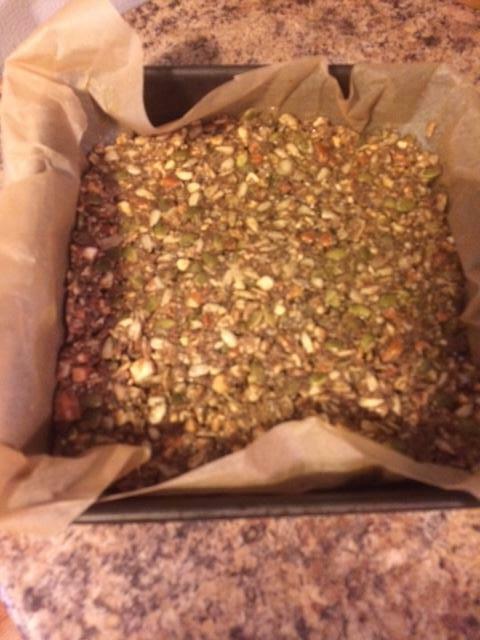 In a food processor, grind 1 cup almonds, then mix in a bowl with 1/2 cup sunflower seeds, 2 Tbsp organic maca root powder, 1/2 cup pumpkin seeds, 1/2 cup flax meal, 2 Tbsp chia seeds and 1/2 tsp sea salt. In a sauce pan, melt and combine 1/4 cup maple syrup, 1/4 cup coconut oil and 1/3 cup almond butter. Add to dry ingredients and mix. Line an 8x8 pan with parchment paper and spread ingredients, packing down as tight as possible. Set in fridge for 1 hour. 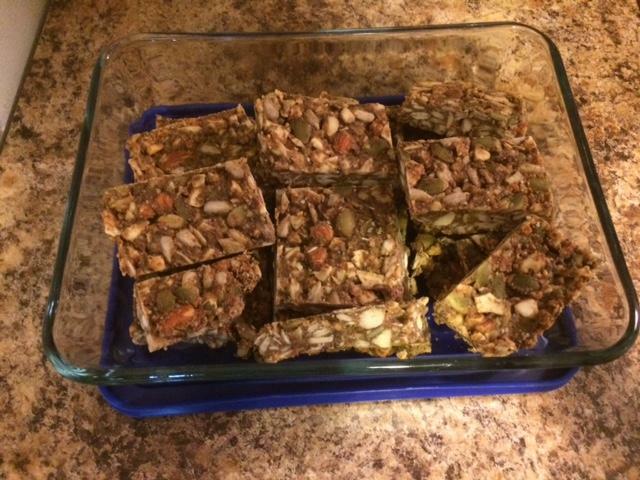 Cut into bars and store in fridge or freezer. I can imagine adding other herbs, nuts and seeds to this, or alternating different types of nut butters or sweeteners--such as honey instead of maple syrup. Try and see what works for you! 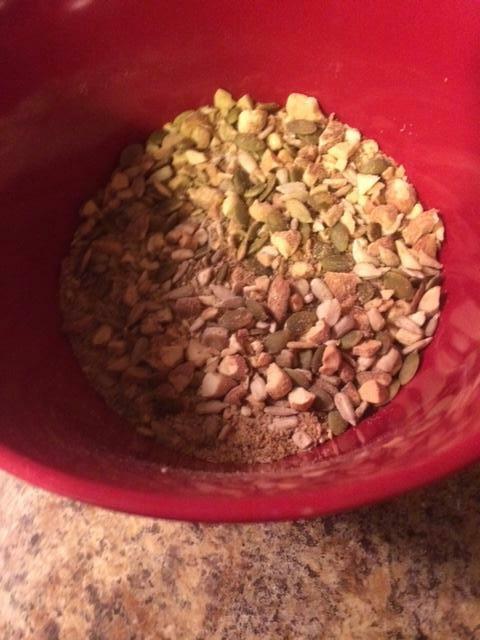 I also added my favorite spices: cinnamon, nutmeg, clove and ginger powder, as well as flaked coconut. It really does stay better if kept in the fridge, and is rich, delicious and satisfying. I find it is also a great accompaniment to a freshly brewed cup of coffee in the morning. Rachel S. Condon, Lic. Ac. When you try acupuncture for the first time, you may be in for some big surprises in how very different this is from going to see your PCP or other medical specialist. For one thing, we aren’t going to send you off for a series of tests or want to run lab work. Nor will we recommend advanced technological diagnostics such as an MRI or CT scan. You aren’t likely to get an additional diagnosis from us either. While Chinese medicine does have a unique and comprehensive way of diagnosing and differentiating one disease pattern from another, we generally find that sharing a pattern of disharmony based in Traditional Chinese Medicine theory, of which most Westerners are completely unfamiliar with, not only sounds strange, but it further mystifies an experience that we are hoping will bring you closer to, not further away from, your own body and your health journey. And, to try to distill three years of advanced graduate study, based on a science and philosophy very different from what most of us grew up with (e.g., modern Western science, reductionism and materialism), into simple concepts that a patient will find both valid and reassuring, is a feat we have yet to accomplish, especially in the setting of a busy community acupuncture clinic. 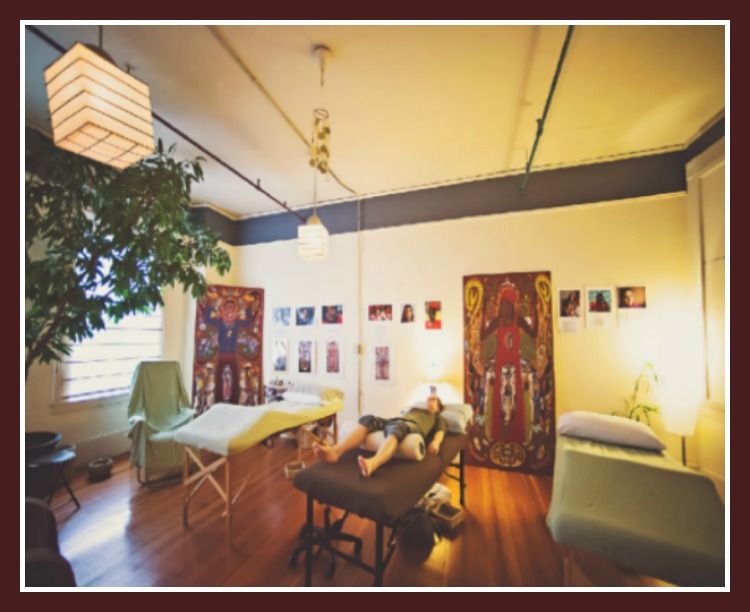 And so, let’s return to another one of those surprises, what is different with experiencing acupuncture, and why you may find it more enjoyable than you think! One of the biggest surprises in trying out this type of medicine is in how simple it seems. The process generally goes like this: once we’ve spent time talking with you and done a health history intake, you are brought into a large, softly lit room, with mellow music playing and lots of colorful artwork, and perhaps a few others having their “needle naps,” and you will lie down or sit in a recliner. And then your practitioner begins the treatment, placing those tiny, hair-thin, sterile needles at places in your body determined to help with your specific condition(s) you would like treated. After making sure you’re comfortable, you are then instructed to rest there, for 30-40 minutes. That’s it. Thus, the radical practice of being still. As our modern, fast-paced, cell phone-bleeping, 24/7 engaged, multi-tasking world will attest, to stop what you’re doing in your day, join others in a room and sit or lie down quietly, and perhaps feel some mild sensations in your body as your internal communication system becomes more front and center, an experience that is often subtle, hard to describe, yet “something” is happening… And to trust that this, in fact, is ALL that you are asking of yourself, your body, your mind - to trust in your body’s own powerful healing mechanisms, with the aid of these, strange, tiny needles… This is pretty radical. For some of us, this is a VERY difficult task. 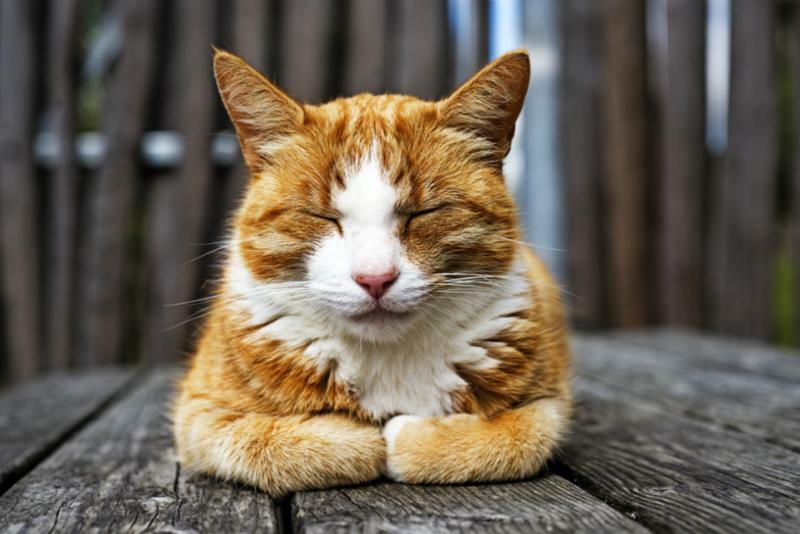 Quieting the mind, especially if one is not used to doing this, as one might, for example, with a meditation or yoga practice, can feel near impossible. And this is why it is a Practice. It is the same thing for anyone who has a meditation or yoga practice, it is not something one starts out knowing how to do, nor is there one “right” way to do it. It is more a matter of surrendering to the experience, to trusting in your own body and mind, and listening. Before we had the Internet and imaging, and concepts such as serotonin and melatonin, we listened and observed - both as healers and as patients. We invite you to re-discover this ancient, intuitive, simple, yet radical and self-empowering practice of Being Still. We will have this article available at the clinic if you'd like a copy, and will be offering it to new patients, as we try to spread the word about the many benefits of acupuncture. Last year we inquired about topics that all of you would be most interested in learning about through our Monthly Newsletter and Health and Wellness workshops. One topic that sparked your interest was that of the 5 elements, which is the basis of Traditional Chinese Medicine (TCM)--the type of medicine that we, as acupuncturists, practice. TCM is considered a holistic, integrated system of thinking, in which each of these 5 elements correspond to their own season, color, and specific aspects of each individual--such as emotions, activities, internal organs and senses. According to TCM theory, good health is provided by the balance and harmony of the following 5 elements: Wood, Fire, Earth, Metal and Water. As the seasons change throughout this year, we will provide information on the element pertaining to that season, including a comprehensive guide on how to approach the season through diet, lifestyle tips and exercise. 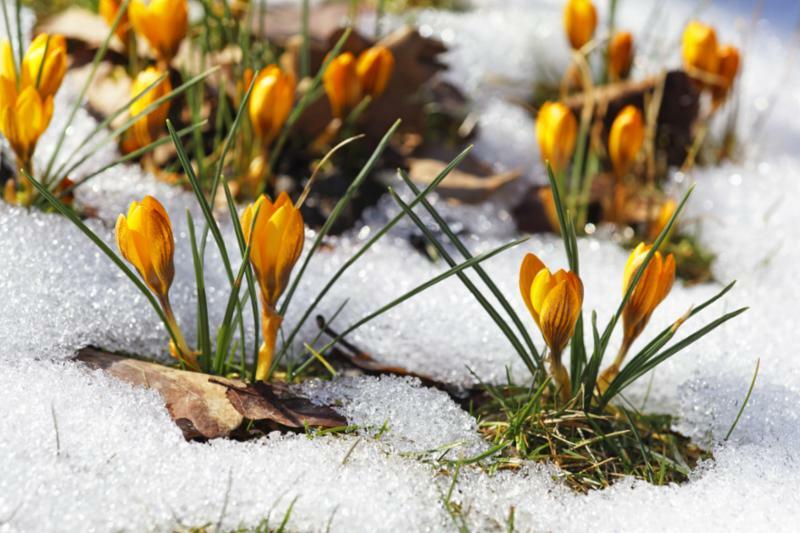 W e will begin this series in our April Newsletter, next month with the onset of Spring, hopefully it will be something to look forward to, so stay tuned!